An eminent scholar, who lived in Hungary and Bohemia in the second half of the fifteenth century; died at Prague 1496. His learning, wealth, and benevolence secured for him the title "Nasi" (Prince), and an influential position at the court of King Matthew of Hungary about 1480. This promotion excited the envy of the nobles to such a degree that they slandered him to the king, and he was compelled to leave the country. He settled at Prague and there established a large Talmudic college, at which he himself lectured. Here, too, jealous enemies persecuted him, and even attempted his life. In grateful memorial of three fortunate escapes, he presented three of the synagogues of Prague with costly curtains for the Ark of the Law. 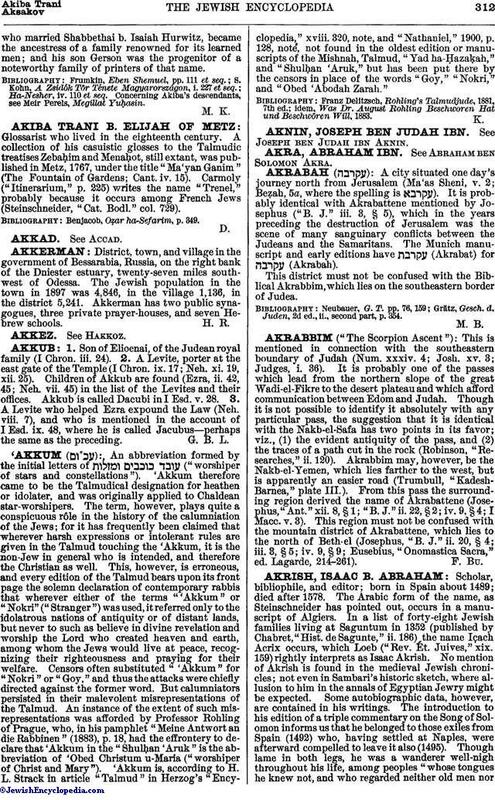 Akiba, who was a kohen (a descendant of Aaron, the high priest), had twelve sons and thirteen daughters: twelve of the latter he gave in marriage to kohens. He was proud of the fact that with his sons and sons-in-law, aggregating, with himself, twenty-five (which number is represented by the Hebrew word , "thus"), he could fulfil literally the commandment of the priestly benediction (Num. vi. 23, Heb. version): "Thus shalt thou bless the people." His daughter Jochebed,who married Shabbethai b. Isaiah Hurwitz, became the ancestress of a family renowned for its learned men; and his son Gerson was the progenitor of a noteworthy family of printers of that name. Ha-Nesher, iv. 110 et seq. 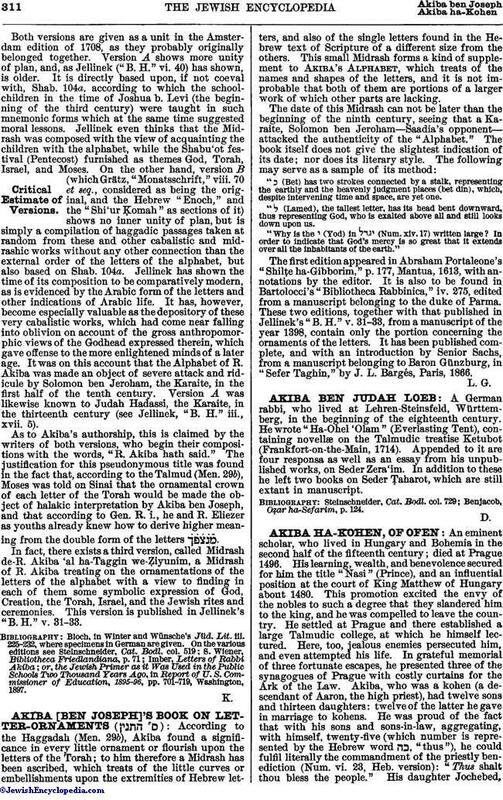 Concerning Akiba's descendants, see Meir Perels, Megillat Yuḥasin.